Hey there, crafty friends! 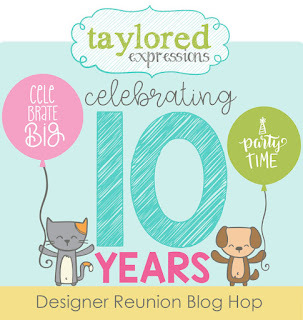 Today I am wishing my dear friends and former colleagues at Taylored Expressions a very happy 10th birthday. I am so delighted to help them celebrate. As you may know, TE was a very big part of my life right up until I moved across the country just a few short months ago. I was a part of their crafty journey for seven amazing years and Taylor herself was one of the first crafters to notice my work and she and her husband, Jon, welcomed me into the TE family. I am so happy to see the company flourishing and continuing to share joy each and every day. 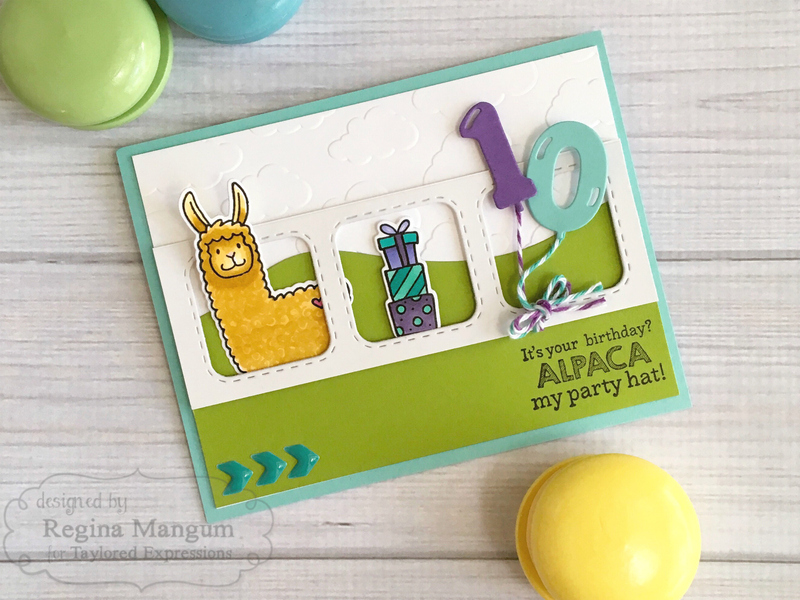 For today's celebration blog hop, I created a fun card using one of my fave stamp & die combo sets, Llama Love. I grabbed my Copics and started coloring in the darling llama, using tight, circular motions to mimic a wooly appearance. I decided to have this happy guy peek through some stitched Peek-a-Boo Squares windows. 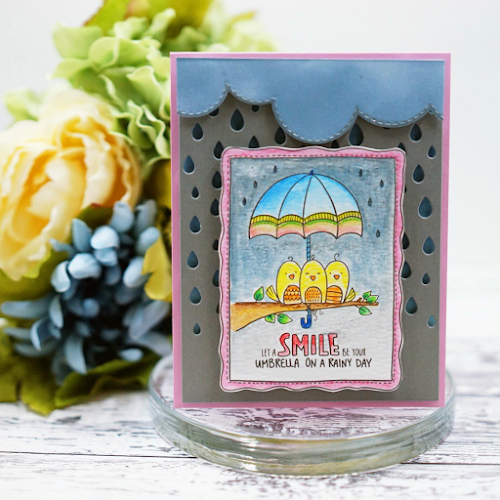 I also used the very useful Cloudy Days Embossing Folder and the old standby Build a Scene Rolling Hills to create my background. Be sure to visit the TE Blog today to get more party inspiration -- with nearly 40 past and present designers participating, it's going to be EPIC! Also, TE really likes to party and has released a ton of new products in the Store, which you can check out HERE. 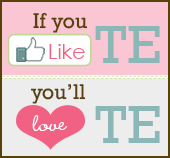 But before you do, I wanted to make sure you know about TE's Share Joy Campaign. It is something near and dear to my heart as I had the honor of helping craft the original concept of this amazing card campaign when it first began. It's really what TE is all about. Please check it out! Happy Hop Time! Taylored Expressions Release Day! Hey there, happy friends! Today is a super terrific day because it's the first big Release Day for Taylored Expressions of the new year! I got to play along and I created two projects that I hope you enjoy. My first card is actually a re-creation of a card I made several years ago for TE, but I've updated it with this nifty new die, When It Rains. I love this umbrella! 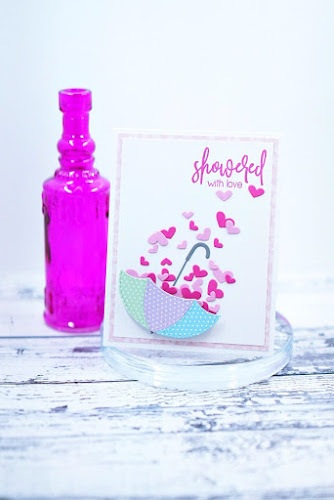 I filled it with Little Bits Hearts in two shades of pink and finished off with the pretty sentiment from the new Rain or Shine stamp set. 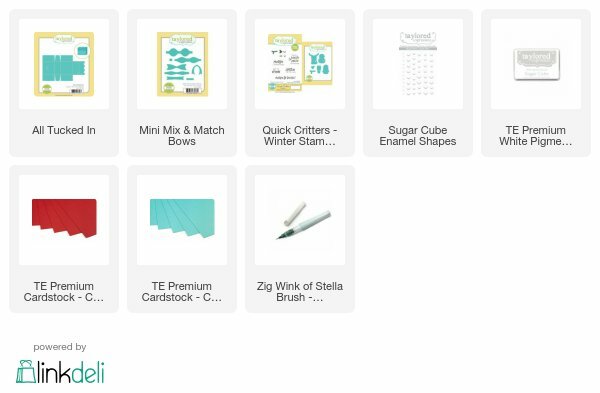 I love the new Patterned Paper from TE -- SWEET! Next up, I got to do some watercoloring with the new Easter Watercolor panels. The new designs are darling! I love this one with these cute little chicks. I used the new Falling Rain Cutting Plate for the background and topped it with my favorite Build a Scene Rolling Clouds dies. With some Distress Ink, I had a nice stormy day that I could brighten up with the panel. 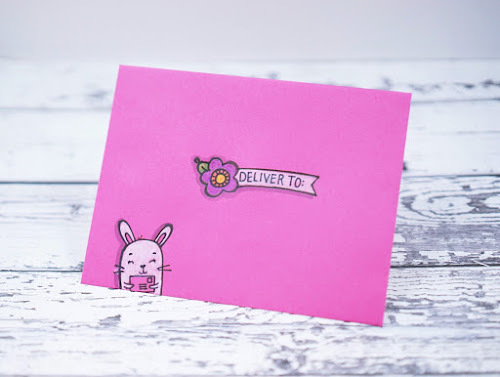 I decorated the front of a TE Envelope using the new Happy Mail stamp set. It's SO cute! I love the little bunny and using colored pencils on to color in really made the bunny and sign pop. 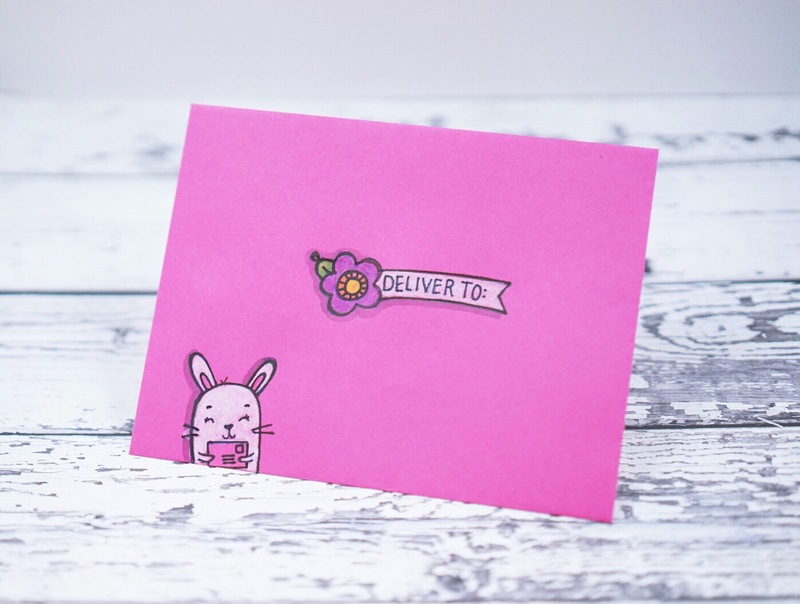 I do hope you'll visit the TE Blog for much more eye candy from their awesome designers! Have a happy day! All Tucked In For Christmas! 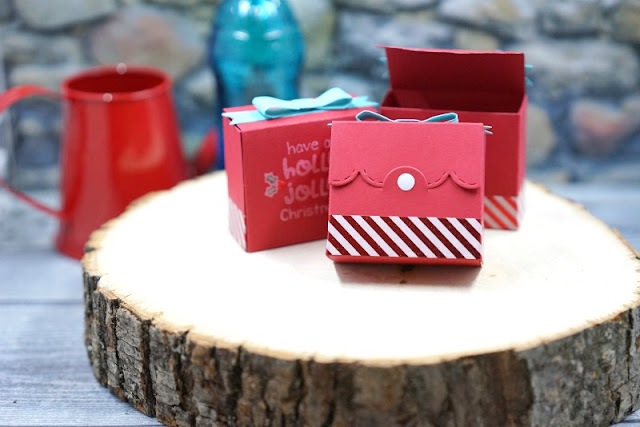 Hey there, crafty Christmas friends! I am just popping in with a fun little project I created for my office Christmas Party. I created these fun little treat boxes using the new All Tucked In die from Taylored Expressions and I love how they turned out! I die-cut each box out of bright, Cherry Pop cardstock, which was easy peasy. I love the little scalloped detail on the front of each box! I added a little Enamel Shape -- it looks like a button and is just too cute. Before assembling, I added some metallic striped wash tape. I stamped this fun sentiment with Sugar Cube ink. I could have used embossing powder to have a really bright impression, but I wanted a 'frosty' look and it dried exactly how I wanted. I added some Wink of Stella in green and Nuvo drops in red to the little holly plant. Super festive! 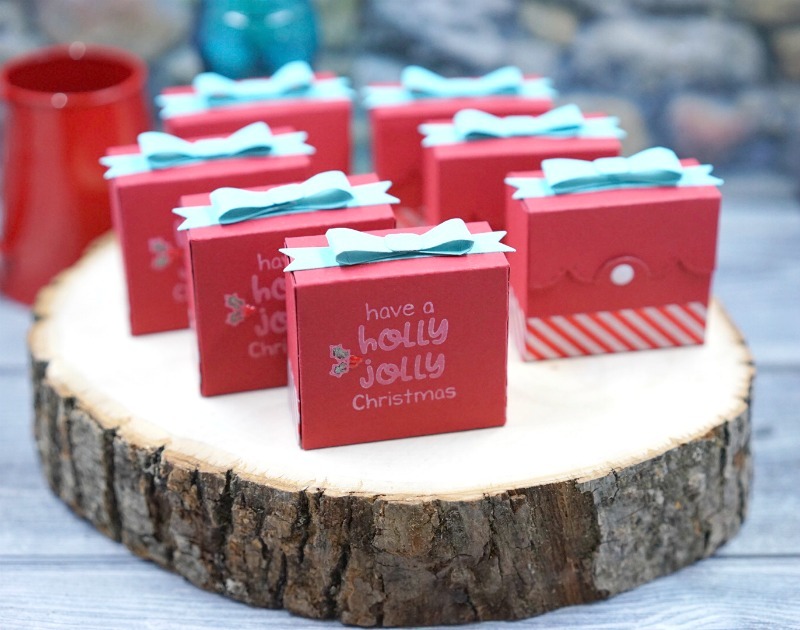 Next, I assembled each box and I topped each with a Mini Mix & Match Bow in Cookie Monster for a bit of non-traditional color. 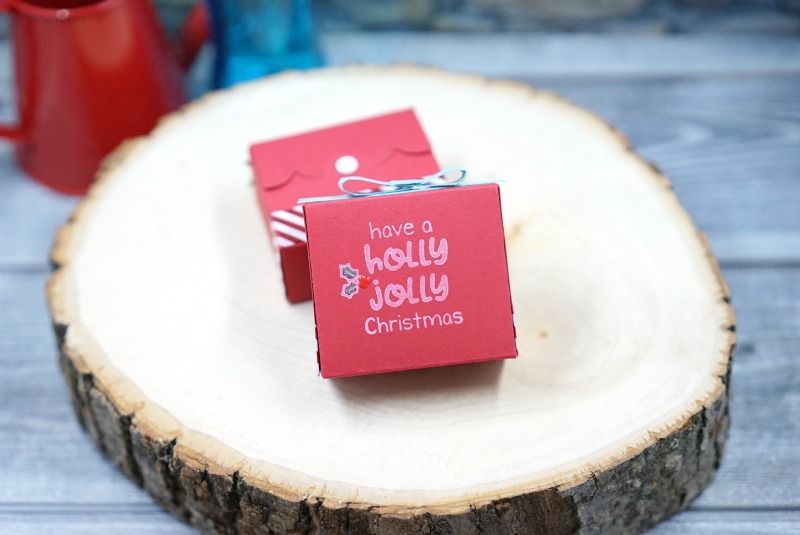 These darling little boxes are going to be filled with a wee treat -- I can't say what because it's still a surprise! Hope you have a super happy and merry day! Happy Friday! I cannot wait for this weekend, can you? I am happy that I got a chance to get into my craft space to create a thank you card for a really nice woman who surprised me with a little gift the other day. She's very chic and stylish, so I reached for the new Mandala Cutting Plate from Taylored Expressions to create a thank you card for her. After die-cutting the plate from Cookie Monster Cardstock, I selectively removed only some of the pieces, leaving the rest intact. I liked the contrast of the solid piece to the outer petals of the mandala. I also added some clear Nuvo Drops for some pretty texture. If you are curious about mandalas, check out the Taylored Expressions Blog for some interesting information and examples of more cards created with this very pleasing symbol of the universe. And have a wonderful weekend! On Display: Taylored Expressions Release Day! Hi there, crafty friends! I can’t believe it’s already November. Where did this year go? Since it is November, that means some really fun new products from Taylored Expressions and I got to play along today! 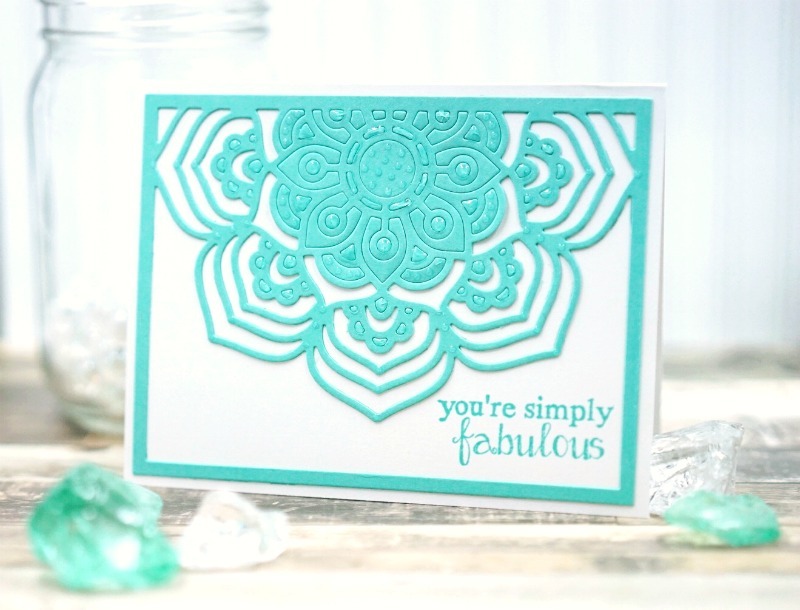 I am showing off one of the awesome new dies that are releasing today. It’s called the Display Easel and I have been pining for something like this for a while. The Display Easel is super easy to assemble. I have seen it put together several ways -- depending on how large of a piece you want to display, you can widen the top based on where you adhere it together. I have smaller, lighter things to display, so this worked for me. I cut the Display Easel from Sugar Cube Cardstock and then a second time with the new Playful Patterns - Bold 6x6 Paper Pad and covered the front and the lip -- I love that I can decorate it however I want! The Display Easel is a great way to show off calendars like this one that I made using the 2018 3x4 Calendar. It's the perfect size! I decorated the calendar with a super cute snowman from the recently-released Quick Critters Stamp & Die Combo, coloring with Copics and adding a bit of pink behind the cut-out heart. I placed the snowman on a bit of hand-trimmed Sugar Cube Cardstock covered in Snow-Tex for some fun 'snowy' texture. Next up, I created a photo display for the easel. I take lots of photos of my husband and my kiddo, but I'm not very good about printing them out and putting them on display. I think that will change now because this was so much fun to do and so easy. I simply printed one of my favorite pics and adhered it to a bit of trimmed cardstock. I framed the photo with the brand new Inside Scallop Rectangle Stacklets dies and the Stitched Rectangle Stacklets. I just adore the little detail! So now I can easily display a calendar (or maybe even give it away as a gift) or a photo on the new Display Easel and I am so excited! I hope you will visit the TE Blog to check out more Release Day fun! 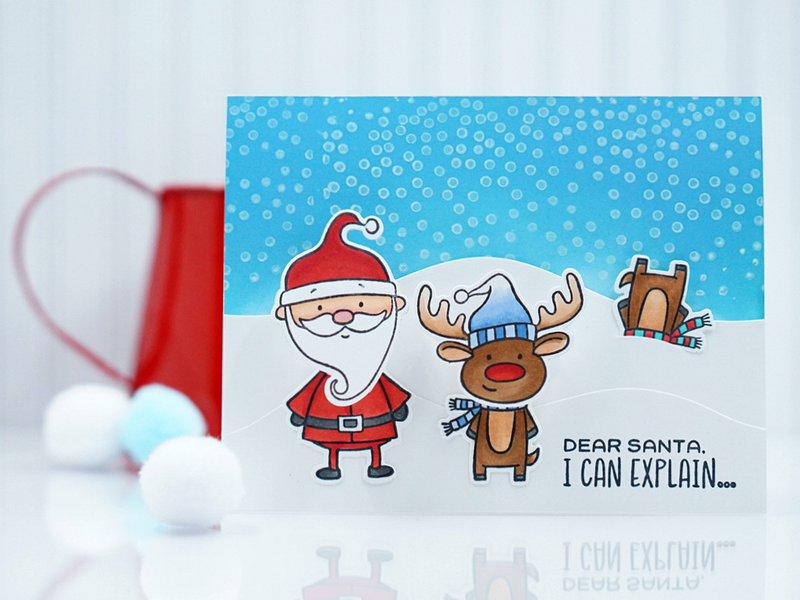 Dear Santa...Taylored Expressions Sneak Peek! It's a Merry Monday, crafty friends! Today I get to help Taylored Expressions introduce its holiday and Christmas Release of new products and I'm definitely in a festive mood. 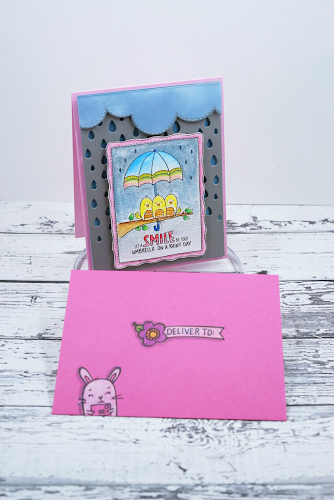 I will be sharing two fun card projects today and I hope you enjoy seeing them as much as I have enjoyed making them! 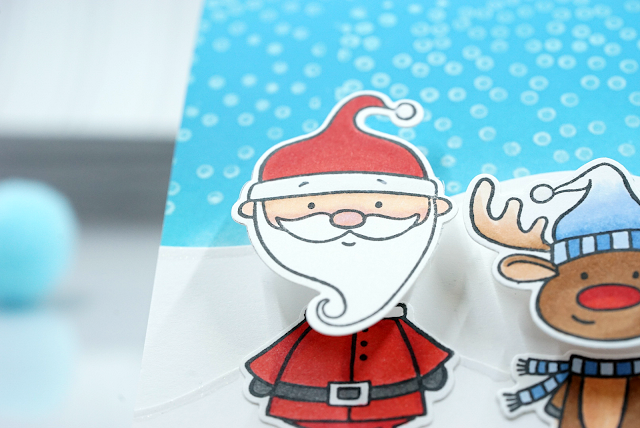 My first card features the soon-to-be-released Santa & Friends and I think it might be my new favorite go-too stamp set for the holidays. It was designed to be used with Mini Wobble springs and it makes some seriously adorable characters. I colored up the Santa and added the wobble spring -- it makes the head into a bobble head! When I saw the included sentiment, I had a mischievous idea. 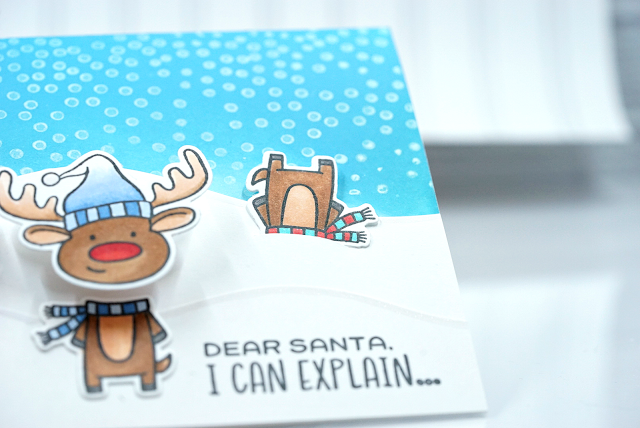 I stamped just the bottom of the cute reindeer and turned him upside down in the Build a Scene Rolling Hills snow mounds that I die cut from Sugar Cube cardstock. I also stamped and colored a full reindeer, coloring his nose like Rudolph. (Maybe Rudolph was finally getting some revenge for being excluded from those reindeer games?) Wink! Wink! My second card also uses the Santa & Friends set, but this time I colored up the sweet little elf. 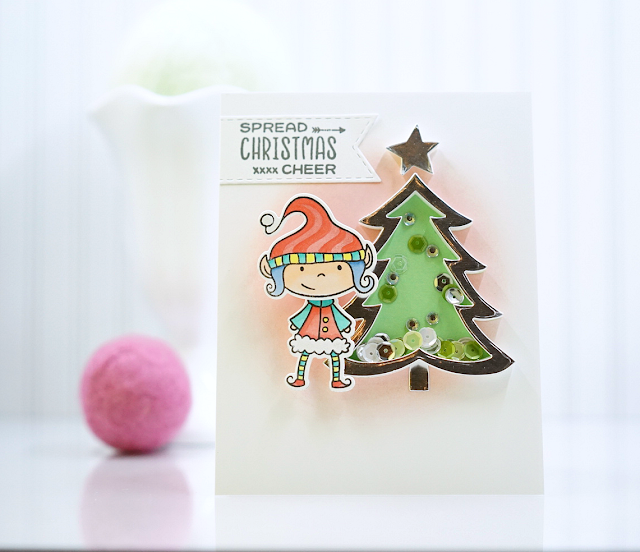 I also used the new, exclusive Christmas Tree Shaker to create this fun shaker. I used the included dies to cut TE Adhesive Sheets and it made creating the shaker so much easier! I filled it up with some sequins and a few crystals for shine. 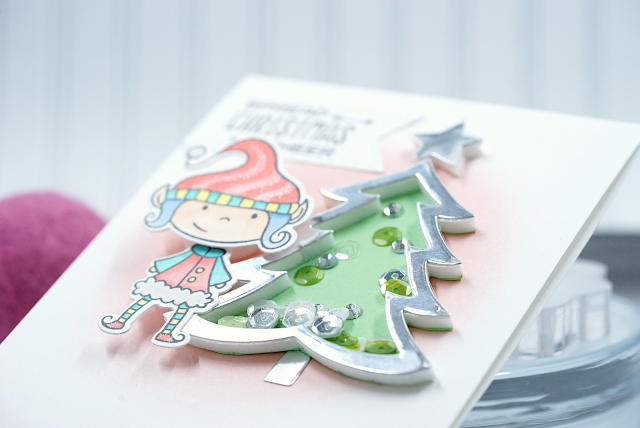 I love the shine on this tree, which was die-cut from new TE Silver Foil Sheets. 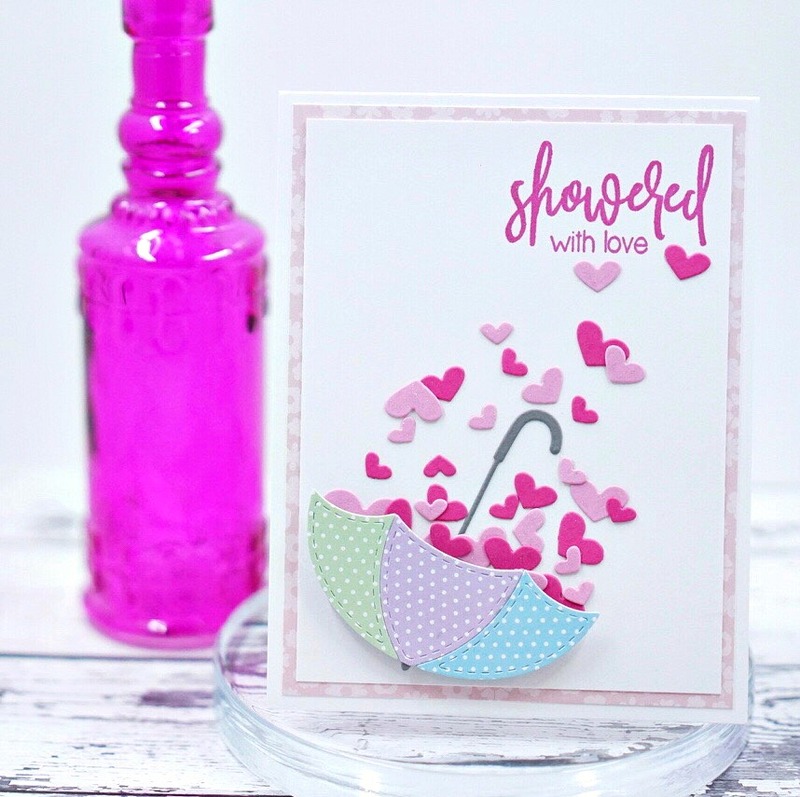 They are stiff like cardstock, so perfect for shakers! 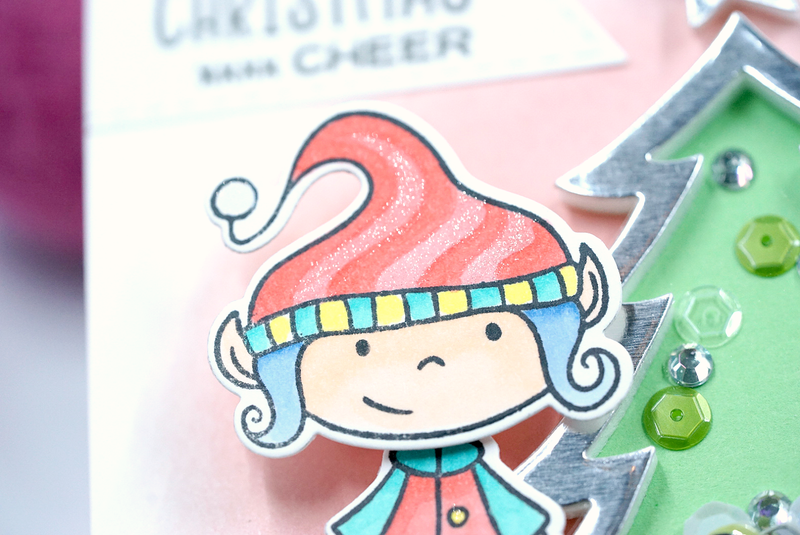 I had a lot of fun coloring up this little elf and couldn't help adding some fun pattern with my Copics and a bit of glitter with a glitter marker. I hope you will visit the TE Blog for tons of eye candy from their fabulous Creative Team. There is A LOT of newness going on this week and now I can't wait for Christmas! Happy Monday, crafty friends! It's a special Labor Day today because this month marks my fifth year working for an incredible company that also happens to be marking its NINTH Birthday -- Taylored Expressions! I have enjoyed being a part of the TE journey nearly from the beginning, when I started as a designer. The team at TE is one of the best groups of people I have ever had the pleasure of knowing and working with! 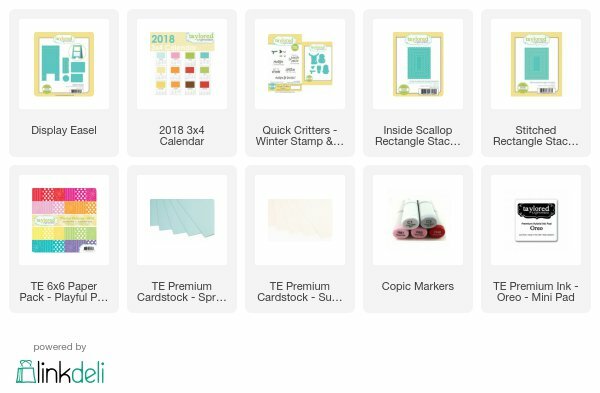 All this week the TE team is partying with party games, prizes, and more -- I got to play along today with one of TE's soon-to-be-released stamp sets, B is for Birthday and I can't wait to show you my project. 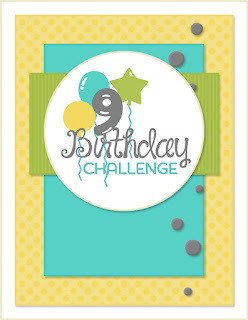 So this card follows a terrific sketch that is part of the birthday festivities -- it's a cool challenge that could win an awesome prize. You can help Taylored Expressions celebrate nine years of sharing joy by creating a card using this fabulous sketch! 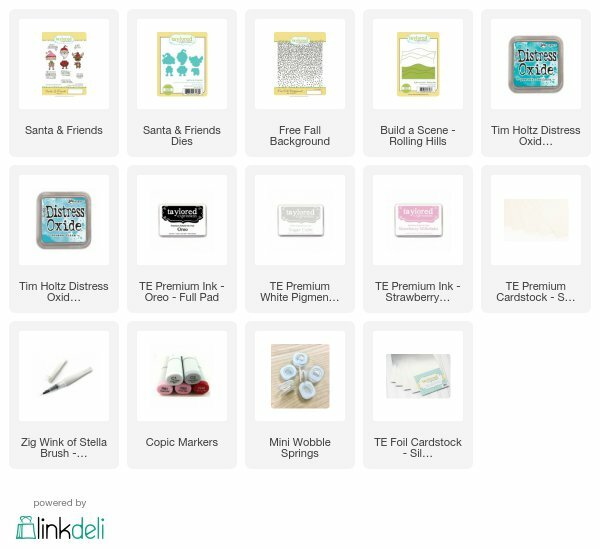 Then be sure to enter for a chance to win one of nine amazing prize packs of Taylor’s nine favorite crafty things each valued at over $115. Best of all, one lucky winner will be chosen by Taylor to join the Creative Team as a Guest Designer for the October Release and will receive an incredible prize package of the newest TE goodies! Click HERE for all the details! I stamped and paper-pieced the adorable P is for PRESENT image. I loosely represented the green strip in the sketch with a row of presents...LOTS of presents! With just a bit of glitter, the bows and polka dots on the "P" really shine. 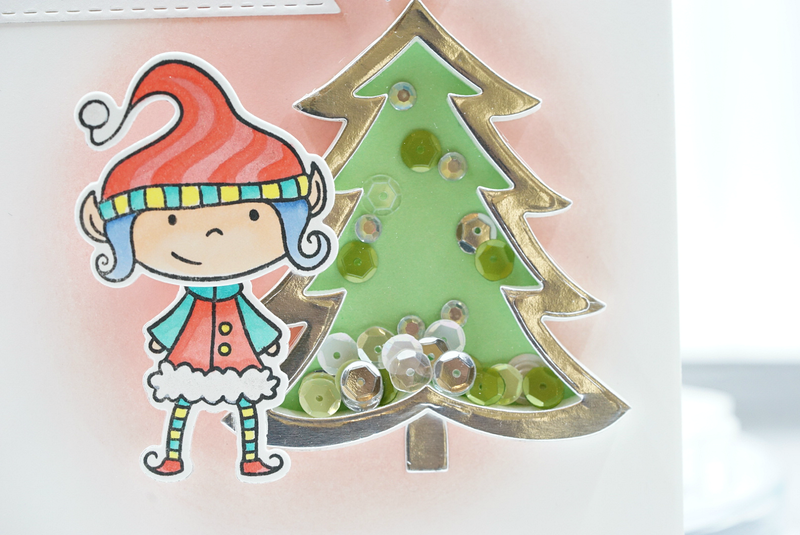 I added a bit of festive texture with the Sprinkles Embossing Folder and added a few of TE's Enamel Shapes as suggested by the sketch. I had so much fun putting this project together! I hope you will enter for your chance to become a Guest Designer for TE. Designing for TE was one of the best experiences of my life. Be is for Birthday will be available for purchase this Thursday. Be sure to visit the TE Blog for more birthday fun and eye candy from the talented Creative Team!